The injury bug strikes again! This time, it has taken a bite out of one of the most star-studded cards of 2012. 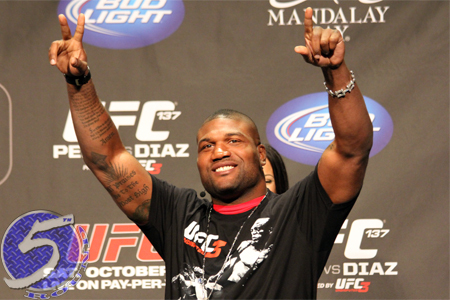 On Tuesday afternoon, UFC president Dana White reported Quinton “Rampage” Jackson (Pictured) has suffered an undisclosed wound that will force the former light heavyweight champ out of his UFC 153 shootout against Glover Teixeira. The scrap was to mark Rampage’s final fight inside the Octagon. After dropping a unanimous decision defeat to Ryan Bader at UFC 144, he went on a worldwide tour blasting the UFC for their inadequate pay structure and lack of appreciation. Teixeira’s long-awaited big league debut had been postponed due to visa issues, but the Brazilian made up for lost time by quickly disposing of Kyle Kingsbury at UFC 146. The 32-year-old hasn’t lost a match since March of 2005, rattling off 16 straight victories during that span.